It may seem like everything is becoming “green” lately, but Thanksgiving? Why not! Often, Thanksgiving meals are loaded up on the brown, carb-heavy foods. This year, why not try to “green up” your Thanksgiving meal? Not only will this increase your vegetable intake, it will make your table more beautiful. Some suggestions are Brussels Sprouts, green and yellow beans, broccoli, broccolini or cabbage. Roasting, steaming, or sautéing are all simple ways to add these gorgeous and in-season vegetables to your meal. Toss them with some slivered almonds for crunch, or a few spoons of diced bacon for a decadent twist, or just let them shine on their own. Refuse to give up anything, instead be mindful of your portions and eat lighter meals before and after Thanksgiving dinner. Include a green vegetable at your meal such as spinach salad, asparagus, brussels sprouts or green beans. Eat Thanksgiving dinner and dessert S-L-O-W-L-Y and truly savor and enjoy every bite. 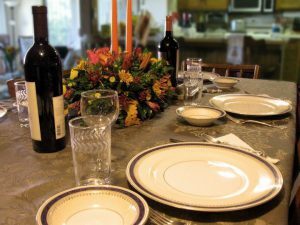 Are you hosting family and friends for Thanksgiving dinner? Or attending a meal, and need to bring a dish? Plan and prepare ahead! 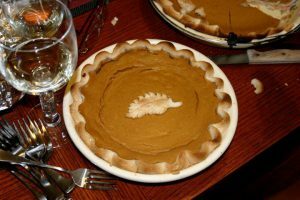 Many dishes that we consider traditional Thanksgiving items can be prepared or started in advance, relieving stress around meal-time, and allowing us more opportunity to visit and enjoy holiday meal company. Here are 3 ways to free up time. Plan it! Making a plan in advance of what you are serving, and when it needs to be prepared is a huge help. If you know what time, and what temperature you need for all your dishes, it’s much easier to coordinate the stove and oven to maximise their use, and minimise last minute panic. Prep it! Many vegetables can be peeled and/or cut in advance. Peel and slice your carrots a day ahead, for example. Mince onions and celery ahead of time for stuffing. Make sure your serving dishes and utensils are clean and ready for use. Pre-make it! Make pie or other desserts in advance, and freeze or refrigerate them. You can even cook your turkey a day or two ahead, carve it up, and reheat it before serving. This reduces pre-meal mess, and also gives you a lower stress day to ensure that it’s fully cooked.